Over the past couple of years, I’ve made this remark to my coworkers so many times that I’m surprised I’m not always met with an eye roll or loud laugh in response. Like starting a new exercise program or quitting an addictive substance, the secret to waking up earlier seems to be accepting your mistakes when you stumble while re-committing yourself to your goal. My most recent effort to start waking up earlier came after reading Scott of Making Momentum’s post Waking Up at 5AM Changed My Life. 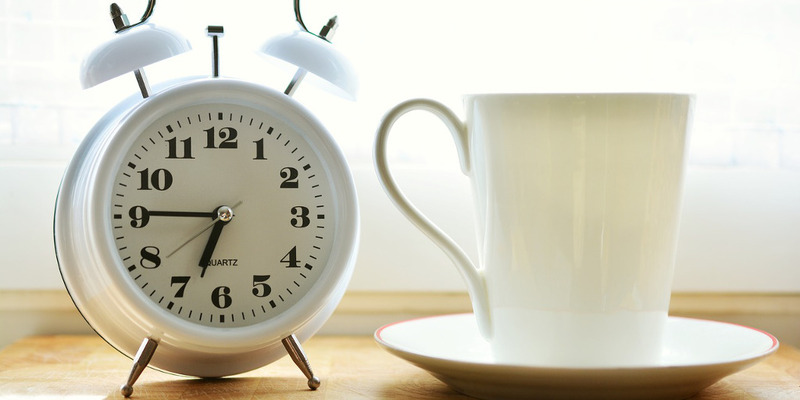 I’ve seen how waking up earlier can help my health, mood, and yes, personal finances! This is my first round of waking up earlier since I had my personal finance epiphany. As a result, I’ve gained a greater appreciation of the financial benefits of waking up earlier. These newly-appreciated benefits (along with a disciplined routine) have helped provide the extra incentive needed to wake up earlier day after day. I’ve written before about how I was literally eating myself into debt. Without a food budget, it’s difficult to estimate just how much you spend on eating out and grocery shopping each month. Odds are, if you don’t know exactly how much you’re spending, it’s a lot higher than you’d expect. This is definitely going to be true if you find yourself eating out frequently, whether with your coworkers at lunch or your friends/family during the evenings and weekends. Using this “extra” morning time to prepare your food for the day only takes 10-15 minutes. However, you can easily save $10+ a day by making your own breakfast and lunch during this time. Even if you only do this during the work week, you can save over $2,500 a year if you normally make regular trips to buy coffee, breakfast, or lunch. I’ve decided to ride public transit to work for the month of June. Hopefully, someday I’ll move to a new city with a better system! Over the past few weeks, though, these reasons for not riding public transit to work have slowly started to disappear – or at least become less persuasive. Rising gasoline prices have made it slightly profitable to drive the train instead of commuting via car (not even considering the wear-and-tear on my vehicle). The economics for commuting to work via public transit varies from city to city. Anyway… What does riding the train to work have to do with waking up earlier? In the past, I would’ve needed to set my alarm clock 30 minutes earlier or more to give myself time to walk to the light-rail station. These days, I’m already awake and ready to go for the day at least an hour before I need to head into work. With plenty of unrushed time each morning, I don’t mind the additional time needed for the convenience of skipping rush hour and riding the train. Instead, I get to use that time on the train for the next benefit: learning something new. After spending many hours reading during my childhood, my reading habits took a serious nosedive after graduating from high school. This isn’t an uncommon trend. Many of us fail to make reading a priority after finishing school. In fact, one-fourth of adult Americans reported they haven’t read a single book (physical or digital) within the past year. Waking up earlier – combined with my extra free time commuting to and from work each morning – helped me buck this trend and finally start finishing some of those barely-started books littered across my apartment. A Pew Research study that found that American adults with an income under $30,000 were three times more likely to be classified as “non-readers.” On the other hand, reading is frequently listed as a popular habit of the world’s richest people. Reading is an excellent way to start your day if you’ve decided to start waking up earlier. Rather than “activating” your brain right before you go to bed, schedule a few minutes each morning to read and learn while your mind is clear and refreshed. What is it that you should read if you want to emulate others who’ve become millionaires or billionaires? While many people love reading fiction for leisure and entertainment, the readers with the highest incomes were regular readers of non-fiction books including personal development, business and management, and historical biography genres. Most skills are only acquired through consistent and repetitive practice. It’s all too easy to procrastinate this deliberate practice when you’re at the “beginner” stage of a desired skill and don’t feel confident in your abilities – or perhaps you’ve been asked to learn a skill that isn’t of particular personal interest. If you’re looking to develop a new skill, whether it’s personal or professional, early mornings are an excellent time to get this practice time into your day. Author and speaker Brian Tracy has talked about the value of starting the morning by eating the frog. The gist is this: By starting your day by completing your most difficult and important task, you’ll guarantee that each day has at least one “victory” while hopefully building momentum for the rest of the day. Right now, one skill that I’m working on some mornings is learning how to play the piano on a keyboard. I don’t have a musical background at all, and I’m starting from scratch, but I’ve found that choosing a “fun” skill like piano helps to complement the time I spend on my career or side hustling (see below). By practicing the piano for a few minutes each morning, I guarantee that I’ve given myself a little bit of “me time” to do something fun before diving into a day of work. Of course, finding time to work on a side hustle while still working a traditional job isn’t easy. Yes, you can take advantage of the benefits of side hustling with just a few hours a week, but if you’d like your side hustle to go full-time, you’ll need to ramp up your time investment. 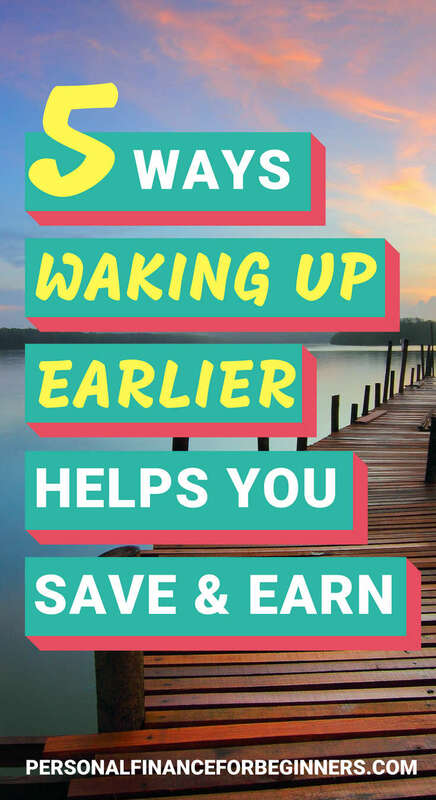 While the first couple points in this post are geared heavily toward saving money by waking up earlier, side hustling is the most obvious way to make some extra cash. Side hustling can require incredible discipline as it requires much more personal accountability than simply showing up to work and reporting to management. Blocking out time first thing in the morning can help you stay consistent in your efforts – it’s easy to lose your evenings to leisure or social activities. Dedicate your mornings to working on YOU. During my past attempts to change my sleep habits, I focused too much on what time I wake up and not enough time on overall sleep quality. I’d start waking up earlier each morning without going to bed any earlier. As a result, I’d start accumulating a “sleep debt” that would eventually be paid off. That was all of the justification I needed to go back to bed. My sleep schedule would also shift by an hour or two on the weekends. I found myself groggy on Saturday mornings and Monday mornings as my body was forced to adjust. Try to get a baseline level of physical activity during the day. I find it difficult to fall asleep if I’ve been sitting all day, so I’ve set a basic goal of 6,000 steps or 30 minutes of physical activity. Use tools like Flux and Night Shift to reduce the amount of light stimulation in the hours leading up to sleep. Set an alarm for 30 minutes before my target bedtime to stop using electronic devices and start getting ready for bed. A full hour would be better! Cool my apartment down to 67 degrees around the time I’d like to go to sleep. Not only is sleeping in a cold room better for you, but I’ve found the drop in apartment temperature to be a helpful cue that it’s time to start preparing to sleep. Sleep in a dark room. I’ve placed a couple pieces of particle board in my bedroom window that block out 95% of the outside light. By using two “panels,” I can slide one over to “open” the window to light. Turn on a portable fan to create white noise. This is helpful since I sometimes wake up due to noisy neighbors, so I can imagine it’s also helpful if you have noisy kids! Follow the same schedule seven days a week. I wish this weren’t necessary, but I’ve found that following the same sleep schedule seven days a week is critical for maintaining the routine. Sounds like a lot of work, huh? After just a couple weeks, I’ve found myself waking up feeling fully rested – often a few minutes before my alarm clock goes off – so I’m afraid I’m hooked! I won’t claim that waking up earlier is the right decision for everyone. I’ve enjoyed lots of late nights – and been incredibly productive on my side hustles – during those late “night owl” hours. That being said, I’ve found that waking up earlier has enabled me to save money on food and gasoline, improved my health and mood, and allowed me to start each day by spending time productively or doing something I enjoy. If these benefits sound appealing, create a routine that works for you. Set a reasonable goal for when you’d like to wake up and go to bed. Becoming an early riser doesn’t have to be waking up at 5:00 am, but having the right routine in place can give you momentum to start each day! Are you a night owl or an early riser? Do you have a daily routine in place that helps you save or earn money? I have been a long time believer in rising early. In my younger, days the reason was to beat the others to the office on Wall Street. Today my goals have morphed and I use the time for my most important action to security retirement. My wife and I run several ecommerce sites and our team is finishing their shift when I get up. Our COO has already prepared the financial report for yesterday’s business and I can efficiently review everything in 30 minutes and send tasks to fix problems. I enter my day job with a calm I’ve never experienced before. By the time I get to my day job, I’ve already put in motion actions that will secure our future when I retire in a couple of years. I just started doing this at the start of the week after hearing a podcast with Hal Elrod who wrote The Miracle Morning then I ran across that same post by Making Momentum. I started waking up 2 hours earlier, so 5:45 AM, and it’s 100% for working on my own side hustle projects. So far the results have been amazing! I feel way better about the day and it’s really satisfying to get so much work done when the rest of the world is asleep. A two-hour shift? Way to go for it! I had to work back 15-30 minutes at a time. I used to trash-talk those “morning people,” but I’ve started to really enjoy the quiet time in the mornings when nobody else has expectations for my time or attention. Good post, Aaron! I am going to try waking up earlier next week. Earlier today, I asked Scott about his experience with waking up at 5. Give it a shot and let me know how it goes! I tried to set a reasonable goal for when I thought I could go to bed (which still proves difficult at times) and then added eight hours for my target wake-up time. Other people like to just set a “dream goal” and go for it. Would love to hear what time and routine works best for you! My issue with most of these suggestions (and similar suggestions in similar articles) is that they could also be done by staying up later at night and waking up later. Meal prep for the next day, set the timer on the coffee pot, read a book, learn a skill, side hustle. You’re just shifting activities from PM to AM, which might work well for your life but isn’t inherently any better. Whether you do them in the morning or evening it’s all about setting your intentionality and choosing to do them instead of watch Netflix (PM) or sleep in (AM). Great points, Katherine, thanks for sharing! I have to confess… Even as a new convert to waking up early, I still occasionally stay up late to work on a project rather than getting up early. People definitely have their own preferences/styles when it comes to getting work done – I love what you walked about with setting your intentionality. That makes all the difference. ? Re the point about doing more at night or in the morning – I guess it depends if you’re a night owl or not but I find anything I do after 9.30 or so is lower quality than what I do in the morning. Also it can depend re other people in the house – working at night I am competing with the tv etc but if I get up early it’s just me and blessed silence. I get up at 545 and am at work by 7.15 though am considering trying 5.00am for more fresh time to work on my blog. Hi, Thanks for your top-notch article. I want to add something with you. I think starting your day early improves your concentration. In addition to being able to focus on goals and task lists without being interrupted by family members or coworkers, getting up early means that by the time you get to work or school, you’ve had hours to properly acclimate yourself to the day. You’ll be more alert during peak hours as a result. Am I right?